The Arts Residency Programme, a joint initiative between Agency for Integrated Care (AIC) and National Arts Council (NAC) launched in 2017, aims to spread the joy of arts to residents in the 9 participating nursing homes. This initiative has positively impacted their well-being. From October 2017 to December 2017, the nursing homes’ residents participated in the programme with sessions led by artists and learnt a wide spectrum of arts; from making clay sculptures, creating paintings using water colours, to using crepe paper to create flowers and plants. 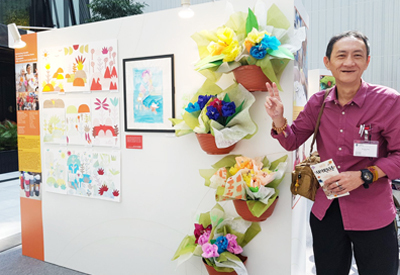 With their acquired skills, residents from St. Andrew’s Nursing Home (SANH) (Buangkok) and All Saints Home (Yishun Centre) jointly created their masterpiece of an array of flowers titled “Multi Bloom”, which was featured as the main backdrop at the “SPARKS! Art Wellness Exhibition 2018”. 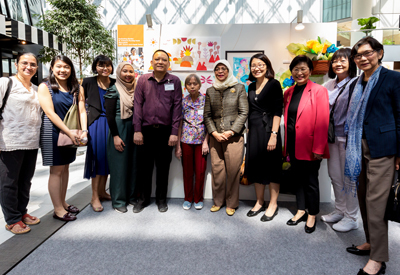 30 art projects by participating nursing home residents were also displayed at the exhibition which was opened on Friday, 9 March 2018 at the Raffles City Shopping Centre Atrium by President Halimah Yacob. Mr. Teo Say Siong, resident of SANH (Buangkok) at the SPARKS! Art Wellness Exhibition 2018. 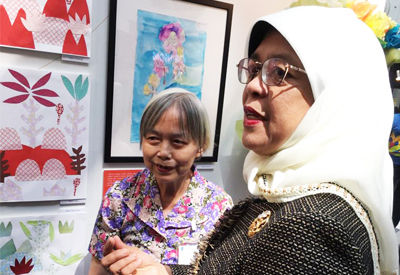 President Halimah Yacob chatted with Mdm. Lim Kim Yin, resident of SANH (BuangKok), at SPARKS! Art Wellness Exhibition 2018 during the Opening Ceremony. President Halimah Yacob, together with representatives from AIC, NAC as well as staff and residents of SANH (Buangkok).